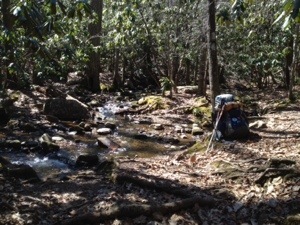 Laurel Creek Shelter, Va. AT mile 669.1, Sat. March 15 — Today started and ended with nasty, trippy rocks. The first three miles up and out of Bailey Gap took three hours. The meat in the middle was nutritious loamy trail bed set in open forest. Delicious. That was followed by an up and over the mountain rock salad. Every tendon in my feet is sore from the twisting and pivoting on the uneven surface. Usually your knees can act as shock absorbers. Not so when you can’t get a square foot plant. The extra 35 lbs. on the back just adds to the fun. The good news is that I enjoyed a lovely lunch by a jolly rushing brook. I found one of the hikers ahead of me having dinner at the shelter picnic table as I hobbled in. He headed out straight away. He likes hiking by moonlight – and it’s full tonight. Good for sleeping too, I thought. What sort of footwear do you use? Boots? I wear light weight Salomon Goretex hiking boots. I never had hiking boots before this year. Always wore low cut running style shoes. I bought some Columbia boots that weren’t too expensive to try out the idea. What a big difference in support and comfort. Every brand is different. You only have to find the one that fits the best.